I've used several brands of smartphones especially big brands, and of course Blackberry. Every brand must have happened damage to its product with varying damage and one of the damage that I will discuss here is damage related to SIM card. There may be some SIM card related damage that ever happened but I took 3 damage I have ever experienced and it seems like this damage is common damage. The above damage is the damage I have encountered and there may be other damages related to the SIM Card. 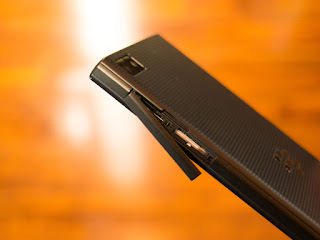 Some cases that I encountered occurred in BlackBerry 10 but never happened in some other brands. From the above mentioned damage we see what happened and what caused the damage.SIM Card unreadableUsually this damage is marked with insert insert SIM Card or insert SIM card which shown in operator indicator display even though we have inserted SIM card to smartphone device, for BlackBerry device usually exist in top right. This damage can be caused by a SIM card or mobile device, and to make sure it is by trying the SIM card to another smartphone that has been confirmed is not problematic. If after a try on several smartphones experienced the same thing that is a SIM card insert then it is ascertained damage comes from the SIM card. Cause Insert SIM CardDamage to the SIM Card chip, this is a common malfunction where yellow chips that are connected to the phone are damaged. Inside the chip is stored data and also the interaction of DC voltage to the SIM Card, and more detail damage can be caused by some things but essentially the chip is damaged and can not be used. I never experienced that SIM is not readable only once in a while but it becomes frequent and finally can not at all, so if often experience this damage better soon the resolve because it could be when we need a sudden SIM can not be used. The solution of the SIM card chip damage is nothing we can do apart from asking for a change to the operator, if we try to tinker and finally can, based on that experience does not last long and will happen again. Not perfectly connectedBetween SIM card and phone chip connected using SIM reader connector in mobile device. Not connected perfectly can be because the connector is lifted so that it does not stick perfectly or SIM Card is dirty. The solution of damage because it is not connected properly, the first step is to clean the SIM card by rubbing using pencil eraser and do not rub with metal objects let alone sharp objects. Also check that the connector pins of the SIM connector are aligned, if one is lifted and you dare to do it to lift a bit with small tweezers or metal, but if you do not understand and do not want to take risks then you can take it to the service. SIM size is not perfectIn general, masi widely used in mobile phones, smartphones and tablets using SIM card-sized mini SIM, but for BlackBerry 10 are all using Micro SIM except BlackBerry Passport already using nano SIM. Operators usually already provide all types of SIM card sizes so that we can change the size according to the operator, and the operator has stock SIM cards of various sizes made from the factory for all sizes with high precision. But sometimes some users when switching devices with different SIM does not request the exchange of SIM to the operator and do the self-cutting that sometimes when cutting, the size is not appropriate or uneven, especially if the cutter used is dull because it is often used. Those who do such deductions are usually mobile phone shops to accommodate the needs of customers who buy their phones. Solution if the size of the SIM card is not fitting is to switch to the operator and also avoid using the SIM card adapter if moving to a larger SIM card, for example from the micro SIM to use the mini SIM users will usually use the rest of the previous pieces to connect to a mini SIM. One effect is that it can cause damage to the device, especially the mechanical components of the SIM card. So far some mobile phone manufacturers do not recommend the use of the adapter, one of which the Blackberry does not recommend it.